GO Laser Tag London is London and Surrey’s newest premier Laser Tag venue. You’ll be geared up with the industry’s newest Laser Tag Gun technology and equipment, playing on our professionally designed Laser Tag Forest Battlefields, whilst being targeted by your friends or family! We are innovating with new computer game inspired game types, and we have purpose built our professionally designed Laser Tag forest battlefields to allow for the most adrenaline pumping Laser Tag games possible. Our sessions at GO Laser Tag London are fully age inclusive from ages 6 and up making our Laser Tag sessions ideal for the most fun and memorable family days, birthday parties, school/club trips, hen/stag dos, corporate and work events or just fun with friends! As Laser Tag is also ‘no-impact’ (unlike Paintball), Laser Tag is also fully inclusive and suitable for people who dislike the idea of getting hit with a paintball, but want the excitement and adrenaline rush of playing on our forest Battlefields. Why choose GO Laser Tag London? Run by the former UK #1 Paintball Player, the GO Laser Tag London team have over 20 years experience in running amazing Paintballing events. Evolving what we offer, and with over 6 years of plans and developments waiting for the right Laser Tag gun technology to be created, we have put all of our experience into creating the most exciting, complete and modern Forest Laser Tag experiences together for our customers. 3 ‘Fortnite’ themed gun options! GO Laser Tag London are the first outdoor venue in the UK to offer three varied Laser Tag weapon options for our players. Rather than just one gun type, throughout a session with us all players will get a chance to play with all three guns at no extra cost! Scoped Assault Rifles, Semi-Auto Sniper Rifles and Light Machine Guns makeup our unparalleled armoury of Laser Tag firepower. Each one of our three guns performs completely differently, enabling each player to change their play style and encouraging them mix up their tactics in order to help their squad to succeed. Looking for Half Term/Summer Events, or Private Midweek Events? 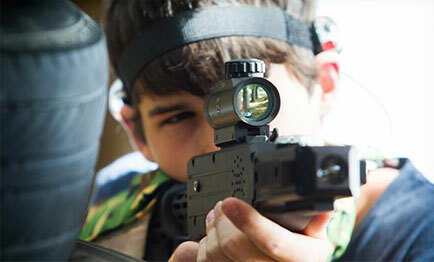 As standard Laser Tag events are Saturdays & Sundays but due to popular demand, GO Laser Tag London offer set midweek dates for Half Term/Summer Break events! Where is GO Laser Tag London’s Venue? GO Laser Tag London is a forest venue based at GO Action Forest, and is ideally located for Surrey laser tag players being close to Jct 6 of the M25, or players travelling to play laser tag from all over London, being the closest outdoor laser tag game provider to Central London. We have a mainline train station only a short 10 minute walk away, and free car parking at our forest venue. Looking for a Laser Tag Kids Party? 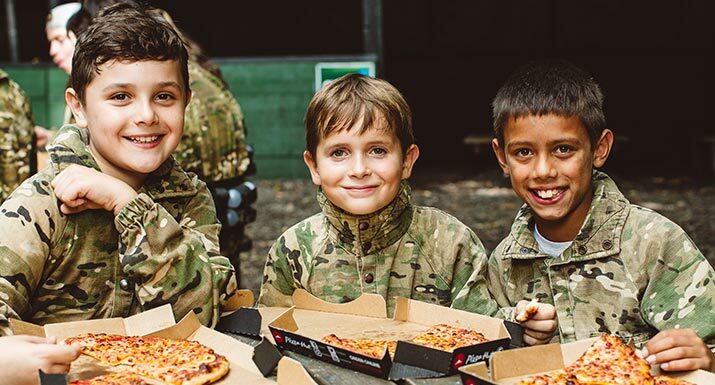 We offer fully inclusive Laser Tag kids parties with all the best Laser Tag equipment, Ninja camouflage suits and 9″ Pizza Hut pizzas per person – keeping everyone well fuelled until home time. Ages 6+, with parents/older siblings/family all encouraged to get involved!